I backed up my notes before I did my android 2.2 update. Now I can't read or import the notes I backed up. Help. Thanks. Please make it so there is an area where the master password unlocks ALL locked notes. Unlocking 1 by 1 takes too much time. I would like to see if you would add a place in locked notes, to allow a user to add a farily long string of unencrypted key words. That way a search engine might be able to find notes based on user-designated references to the content of the note. Hi, I have 2 tips for You. Is it possible add possibility to change color of days in calendar? Sunday and saturday have got other color than other days, but for example this month we have 3 days off / free day, similar than sunday / isit possible to add changing this color? And my second ... when I use witget 2x2 for DAY, I can see only all day reminder, not time reminders.. is it possible to add possibility to see all reminders in this widget? tnx a lot St.
Are you interested in russian translation of this app? I can do this for free. I am really interested to provide an offline dictionary for Spanish - German. I have some suggestions to implement. Have you any bug tracker or something else to hold them? In other words how to send them to you to protect them from losing? And if you want I can help with such features implementation. We ran ColorNote through some of our security tools and found some issues. We would very much like to use ColorNote, however. Is it possible for you to fix some of the issues that we have identified? Please contact me at steveq[at]nist.gov. Thanks, Steve. I have installed the Color Note application version 3.3.6 on my HTC mobile (android system). I used it a while and now I received an error message: "The application ColorNote (process com.socialnmobile.dictapps.notepad.color.note) has stopped unexpectedly. Please try again." The problem is that I cannot use the application and I'm afraid that the only way to solve the problem is to uninstall the application and to re-install. But, in this case, I will lose all my notes. Can you help me, please, in order to fix the issue and to save my existing notes? Can you please create an update where we can select all notes and share them through email? Or an option to export into a word file or something. I need to get my notes out of my phone. Please help. Is there a way to select all the notes and say delete them all at once instead of one by one i have over 700 and this will take forever. I LOVE this app. Thanks so much! Can I offer a couple of suggestions? 1. Ability to Sync... with Outlook, Google Tasks, or some other online task service (even one you've designed for the web). 2. Audible reminders. Play a sound when a task is due. Love the app, any plans to bring it to the iPhone? but can not login using google account sync, a sync on a "network error." ConnectTomeoutException Connect / 59.24.3.173:443 timed out. Troublesome official update, it fixes this bug. When adding a note through the calendar, it doesn't appear in the workspace. Is it a bug or a feature? Its one of the best app that i have ever used on my android phone.The backup and sync feature is Awesome!!! Kudos..
My wife wrote down a TON of notes each day about my infant daughter and what she did every day. She then saved all the backup files and updated her phone. It is IMPOSSIBLE to import those notes back into Colornote using all the default passwords (0000,1234 etc) and any password that we have ever used in the past. It says "done" but nothing gets recovered. I know the information is in the backup, but there is no way to recover it to a readable state! Please respond, this is really valuable information! I just literally read for 2 hours about how many hundreds of people are in the same boat I am in! There has to be some way to import these files and convert them to text on the computer if the app won't do it! Feel free to contact me at jfowl31 AT gmail.com and I will email the backup files that need to be saved! I've tried installing older versions of the app, countless password combinations, and none of them yield anything, and the information inside is indecipherable to me and can't be translated as far as I can tell. I am using colornote, and it's a fine app. But, how can I sync colornote witch my google task? Online sync question: Can one view whats stored online and can one erase it completely if they no longer wants to have their data online? 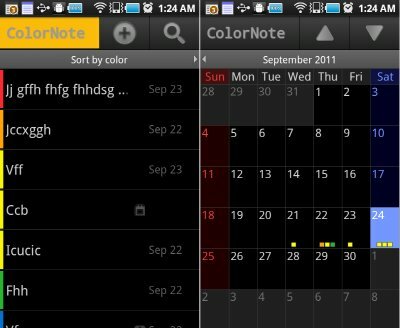 In Colornote there is an option to sync/backup the notes. When I try to do this I have three options to sign with, Google account, Facebook account and e-mail. I want to sign in using e-mail, however I don't understand how to register such an account. Can you help me? Any chance of getting Color Notes for Nook, thru Barnes & Noble? Excellent and beneficial post… i am so grateful to left comment on this. This has been a so exciting study, would really like to study more here…. Hi, i m trying to restore/sync my data from my old phone, but while signing in it gives error "a network error has occured ssl peer unverified expection no peer certificate"